Käsespätzle is a symbolic dish in Bavarian cooking and on beer garden menus across Germany. Chris prepared a Swabian version of the dish which he learned during his Kaltenberg castle days. We also show you how to make spätzle from scratch in an easy to follow tutorial. Because homemade spätzle always tastes better. Käsespätzle is a Bavarian egg noodles dish with butter and cheese. In English the name means ‘cheese spätzle’ and is pronounced ‘kays-shpatz’l’. Sometimes the spelling ‘kaesespaetzle’ is used in English to convey the umlaut a sound which falls between a and e.
The word ‘spätzle’ (plural for Spatz) itself means ‘little sparrows” and has to do with the shape of the little egg noodles. Spätzle is prepared in a variety of shapes actually, depending on the tool used to cut/shape them. Its texture is, in my opinion, much better than that of elbow macaroni or similar. In comparison it is looser and softer – not at all chewy. Perfectly light small pieces of boiled dough. Käsespätzle is one of the most popular dishes served in beer gardens across Germany, especially in Bavaria (it originated in the Swabia region). There are small regional differences in its preparation – in Swabia they use a cheese spätzle recipe like Chris’. Rather Chris uses a Swabian recipe.. Near Munich they often follow slightly different steps. In Austria Käsespätzle is known as Kasnocken and is a popular dish in mountain lodges of the Austrian ski areas. 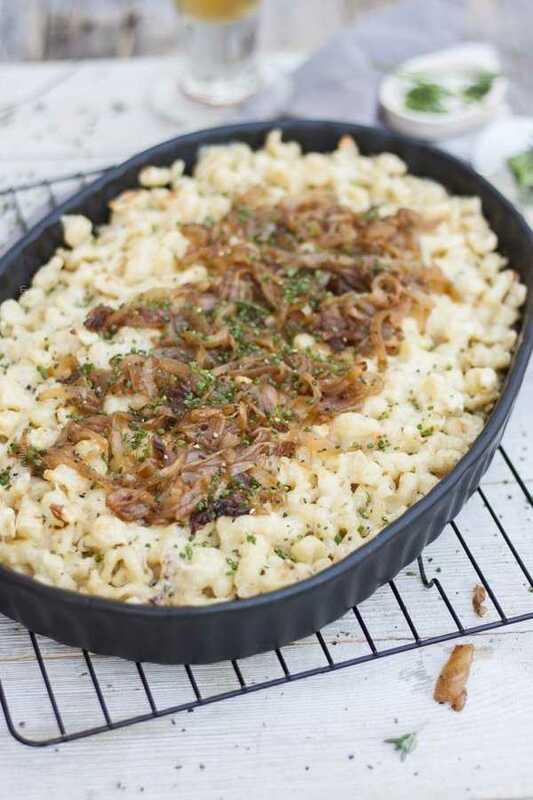 The main ingredients in Käsespätzle are fresh spätzle, cheese, butter, sauted onions and chives. And salt – what savory dish doesn’t need salt? You are guaranteed to hear people saying that Käsespätzle is a version of mac and cheese and I beg to set the record straight. If anything – the opposite is true. There was Käsespätzle long before there was mac and cheese. It most likely inspired mac and cheese. Also, the types of cheese traditional for the dish will never have it look or taste like mac and cheese (assuming the most commonly used cheddar with its orange hues and sharper flavor). Lastly while mac and cheese is drenched in a cheese and cream sauce, traditionally Käsespätzle is coated in melted cheese and a little bit of melted butter. And it tastes soooo good. And it pairs with beer even better. For variations of Chris’ recipe read the Tips and Twists section under the recipe card. 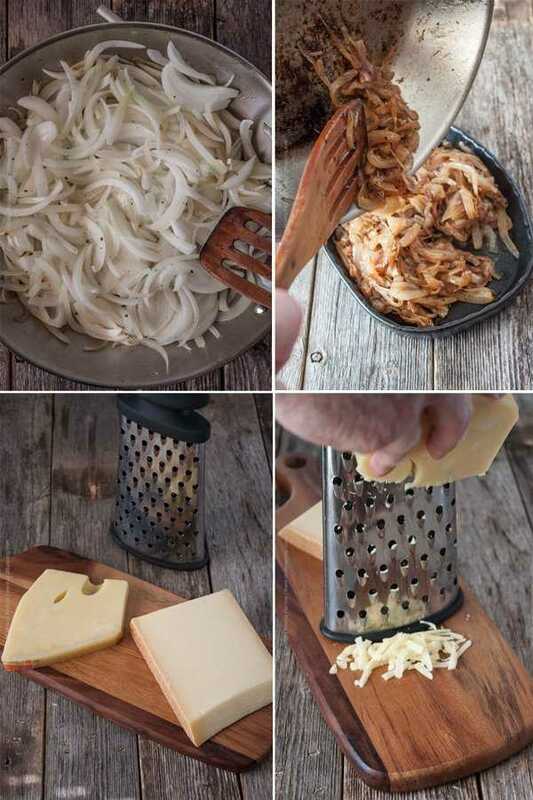 Overall as long as you use high quality spätzle, traditional good melting cheese (more info below), onions and chives for garnish you can recreate this classic dish without too much effort and enjoy it with your favorite German brew. Or a saison. Saisons seem to pair extremely well with everything. Homemade spätzle is very easy to prepare. Don’t let your unfamiliarity with the process intimidate you and prevent you from making it. Not hard at all as long as you have a mixing bowl, wooden spoon and a colander and even easier if you use a stand-up mixer and an inexpensive spätzle maker (so fun to use) like ours. Read more on spätzle makers at the end of this post. There are only a few simple steps you need to complete to prepare delicious homemade spätzle. Start by mixing flour, nutmeg and finely chopped fresh herbs (herbs are optional, Chris swears by adding them and favors thyme and parsley). Make a well and add beaten eggs. Mix using the dough hook (or a wooden spoon if mixing by hand). Mix for 16-20 minutes, until the somewhat loose dough begins to just pull away from the sides of the bowl and is stretchy if pulled with a spoon, but not stiff. Wait until you see tiny bubbles as in the last image of the grid above). These are air holes that begin to form/pop. If you don’t see any, mix for an additional minute or so. If the dough is running too thin, add flour. If running too thick, add a bit of water and continue to mix until you have the right semi-runny consistency. Once you have the dough, it is time to make the spätzle. Place or hold spätzle maker or colander over the pot of boiling water as shown above and add dough. Force the dough through the holes either by sliding back and forth or pressing down with a scoop and the little ‘sparrow’ shaped noodles will start falling into the boiling water. In a few minutes cooked spätzle will float to the surface. Scoop with a skimmer and place in a colander to drain. Rinse the spätzle in the colander with running hot water and shake off any excess water. It really doesn’t take that long nor is it that difficult. You might actually enjoy the process. Chris learned the art of making spätzle while working at the Kaltenberg Castle Royal Bavarian brewery and beer hall in Lionshead Village (Vail, Colorado). The place is no longer there, this was when we first met, i.e. a long time ago. He says he remembers standing on a crate next to a huge pot of boiling water and grating tons and tons of dough to make spätzle. Spätzle can be served in any number of ways. Traditionally it is a side for roasts, but you can see it accompanying anything from Schnitzel and Pork Cordon Bleu to Goulash. And, of course, when eaten with cheese as a main dish it is known as Käsespätzle. Can You Buy Premade Spätzle? Of course you can. Typically it will be in dry form, just like pasta and you will need to boil it, strain it and then proceed to use it. Certain stores carry frozen or refrigerated fresh spätzle – if you are in luck yours does to. Once you have secured fresh cooked spätzle you need to consider the cheese element of the dish. Traditional Käsespätzle cheese is mild and melts easily. Look for Swiss cheese such as Emmentaler or Gruyere. Next, you simply must have fried onions. Most frequently they are sauteed until caramelized, but often times they can actually be fried to crispy. The whole dish is traditionally garnished with finely chopped chives. 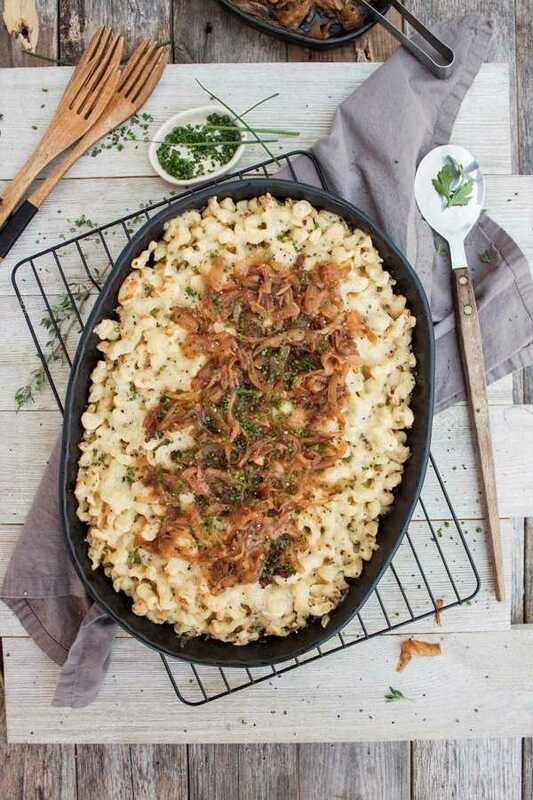 Follow these easy steps to a decadent Käsespätzle dish. Saute the onions in cooking oil or a combination of butter and cooking oil and then transfer them to a small dish and set aside to cool off. Grate the cheese and set aside. Melt butter in a pan and toss the fresh spätzle in it, let it brown a bit (about 2 minutes). Slide the buttered, browned spätzle into a casserole dish and spread to cover the bottom. Brown another batch of spatzle in butter and slide it onto the cheese layer in the casserole dish. Add more cheese and bake in 400 F oven for 10 minutes. Käsespätzle with made from scratch spätzle noodles (or store-bought if you prefer). 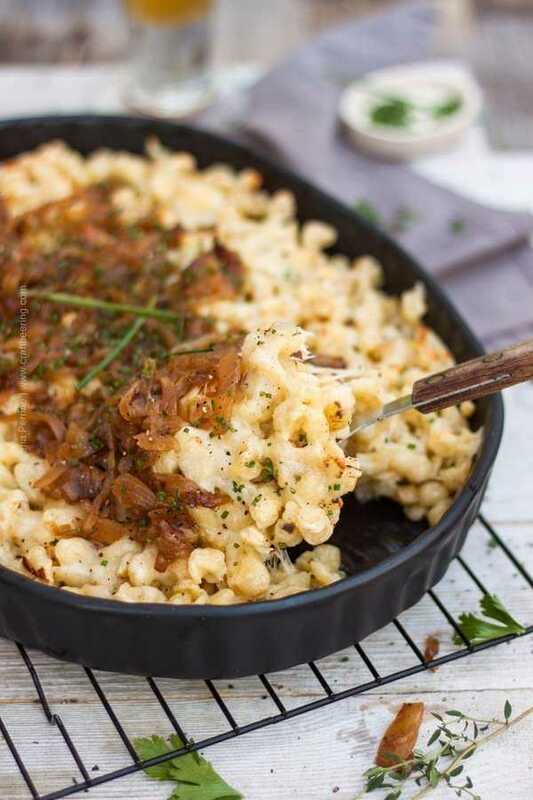 Melty cheese and a healthy dose of sauteed onions make this decadent dish a beer garden menu favorite and a homemade comfort food. In the bowl of a stand up mixer equipped with the dough hook add the flour, salt, nutmeg and herbs. Combine well and form a well in the middle. Add the beaten eggs, then the milk. Turn on the mixer on medium and let mix for 16 to 20 minutes. The dough will begin pulling off from the sides of the bowl but still be quite sticky. Look for tiny air bubbles to begin forming on the surface. You may need to mix for an extra minute or two until you observe bubbles. Boil about 2 quarts of water (with a pinch of salt) and place your spätzle dough maker above the pot with the water. Load with dough and slide back and forth or press to squeeze the dough through and form the spätzle noodles. Once the spätzle begins to float to the surface, scoop with a large spider or skimmer spoon and transfer to a colander placed inside a bowl (for drained water to collect). Continue process until you make all the dough into spätzle. Rinse the spätzle in the colander with running hot water and shake off any excess water. In a large pan heat the oil and saute the sliced onion until it begins to turn light brown in color. Add a little water occasionally to keep it from burning. Continue until completely browned. Transfer to a dish and let cool down. Melt 1 1/2 tbsp butter in a pan over medium-high heat and toss about 2 1/2 cups of cooked spätzle in it. Cook for about 2 minutes until slightly browned. Transfer the browned spätzle to a casserole dish (about 9 x 13 inches large) and form an even layer. Cover with half the shredded cheese. Brown more spätzle following the above steps, add it on top of the cheese layer and then add the rest of the cheese. Bake for 10 minutes, take out of the oven and garnish with the sauteed onions and chives. Serve. If making the spätzle from scratch be advised that this recipe will yield more than you need to prepare a 9 x 13 inches casserole of Käsespätzle. You can freeze or refrigerate (tossed in 1 tsp olive oil) the leftover spätzle and use later. Alternatively, prepare half the quantity using half the ingredients and use a slightly smaller casserole than 9 x 13 inches. If using store-bought spätzle, follow the package instructions and then proceed with the Käsespätzle recipe as written. Notice the we used a combination of Emmentaler and Gruyere. If you want a sharper cheese flavor you can use all Gruyere or even add a bit of a sharper cheese. In between the first layer of cheese and the second layer of spätzle add a layer of sauerkraut and proceed with the recipe. Add a layer of bacon bits in between the cheese layers. Brown the cooked spätzle in butter just as instructed, but then toss with a couple of tablespoons of your favorite herb pesto and proceed with the recipe. 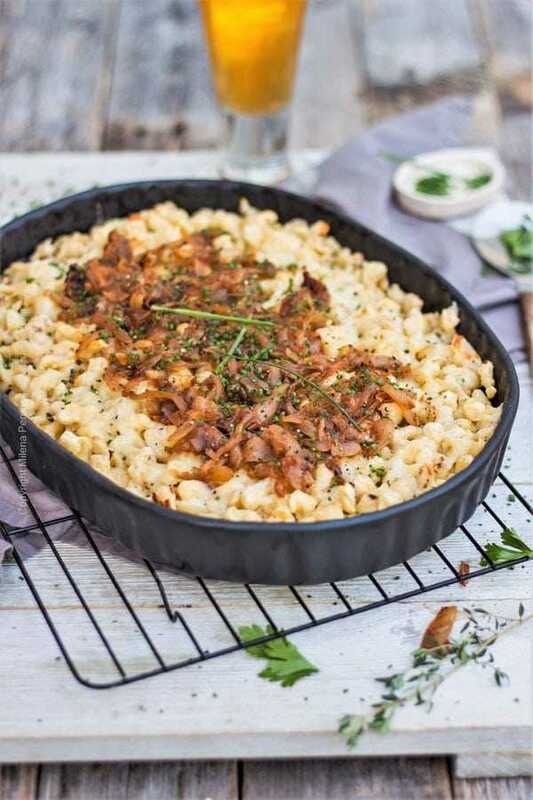 Smother the baked Käsespätzle in Jägersoße (‘Hunters sauce’, a creamy German sauce with mushrooms and bacon). Make a batch of beer cheese sauce and toss pan butter browned spätzle in it, mix well and enjoy immediately without baking. There are a few different kinds of spätzle makers. You can also always use an ordinary colander, add dough to it and use a spatula or dough scraped to force the dough through the holes and into the boiling water. We use the slicer type spätzle maker you see in the pictures for this post. There is also a press style spätzle maker which produces longer strand shaped noodles. A spätzle sieve such as this one is also commonly employed. I haven’t made spaetzle yet, but I’ve been reading a bunch of recipes in preparation. Your method varies quite a bit from all the others in that you mix the dough for 16 to 20 minutes. All the others mix quickly and let rest in the refrigerator for a while. Why does you recommend your method? I’d love to know! I’m planning to make this dish for an early Oktoberfest party this weekend! Hi, Heather and thanks for stopping by! The dough gets mixed for that long in order to become stretchy (the gluten develops during the mixing). It is much easier to run it through the Spatzle press. Chris learned this recipe in a Bavarian restaurant many years ago and said that while he worked there they never once had to refrigerate the Spatzle batter/dough. However, keep in mind that there are hundreds of spatzle recipes out there and if you include the Hungarian and Czech versions of Spatzle even more:) Some people use semolina flour (higher in gluten) and no milk, others let the dough sit out all morning and mix it occasionally and yet I have seen people when I lived in Germany to just barely mix the ingredients and go ahead and start making the spatzle (dough is runnier and longer strands of Spatzle form, more like noodles). I guess it depends on what someone is used to doing. 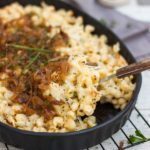 We have made this recipe multiple times at home and it works out pretty well, the Spatzle is delicious even when just tossed in the butter! Hope you have fun at your party! I drool a little bit every time I see your spaetzle cross my social media. Really, really need to make this over Oktoberfest! You should! It is sooo delicious! I cannot eat pasta like penne or even elbow (texture problem) but Spatzle is a whole different story! And the Gruyere…mmm. Thanks for stopping by, Amanda! Oh my goodness, this reminds me of my time in Germany. Your tutorial looks fantastic! Hope you are having a great week and thank you so much for sharing with us at Full Plate Thursday! OH WOW! There isn’t anything about this dish that I don’t absolutely adore!! You can never go wrong with this!! YUM! Wow, what a great dish to have with beer! I am sure I would enjoy this better than mac and cheese! We had spaetzle made from a German friend, just dressed in butter, and I’ve watched her making them from scratch. Pretty awesome to watch. Really love your kasespatzle!